Target Field station in downtown Minneapolis will be the northernmost stop on the proposed Southwest LRT. Photo courtesy of Maury Landsman via Flickr. Southwest Light Rail Transit (SWLRT) is the most expensive public works project ever proposed in Minnesota. Hennepin County’s share of the SWLRT funding worth nearly $656.65 million of the $1 billion project, according to the Southwest Journal, a good portion of which will be paid by a county sales tax increase. Sales taxes are regressive and have the biggest impact on low-income residents, and include most services, gasoline, cigarettes, alcohol – pretty much everything but clothing and grocery food. People who support Southwest LRT because they support light rail in general might consider that the air-conditioned, Wi-Fi equipped buses from Eden Prairie to downtown Minneapolis currently take 20-minutes while the light rail would take 41-minutes. 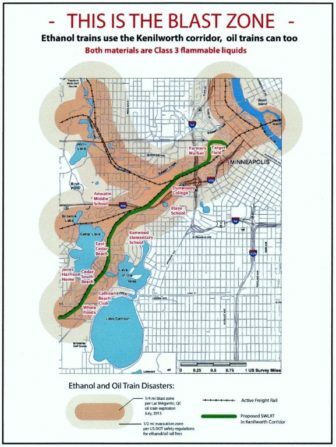 SWLRT in Minneapolis is planned to run in a narrow corridor between backyards, condominiums and heavy freight trains that carry highly flammable ethanol and oil. It would track through a residential area and then in the parkland between Cedar Lake and Lake of the Isles. The route would eliminate a 44-acre urban forest and the popular Kenilworth commuter bike trail at least during the two-year construction period. It would include a submerged half mile long tunnel with solid steel sheet sides pounded down 55 feet to anchor the train that would otherwise pop up and down with fluctuating groundwater pressure. The tunnel would be permanently dewatered daily according to the Burns & McDonnell water study (2013-14) for the Metropolitan Council. The study theorizes a rate of 15,000 gallons per day dewatering from inside the tunnel into sanitary sewers, which were not built for that much fluid traffic. The water would run through treatment facilities and fed into the Mississippi River. Another 9,000 gallons per day from around the tunnel would be piped into storm sewers, treated, except for chlorides (salt) and returned into the groundwater. The Burns-McDonnell water study continues, “Impervious steel sheet pile walls…will extend ten or more feet beneath the water table in some areas and, therefore, [have] the potential to block horizontal groundwater flow and potentially result in an increase in water levels.” Which means flooding. The uncertain groundwater movement to resupply lakes Cedar, Isles and Maka Ska with natural spring water is a water quality conundrum. In fact, the Met Council’s 2016 SWLRT Final Environmental Impact Statement noted adverse effects to the Minneapolis Chain of Lakes. The possibility that flooding would affect the groundwater level, the freight line, the proposed shallow tunnel, the Bryn Mawr-Penn Avenue LRT station, and nearby residences – is not elaborated. Lake levels, water quality and the absorbency or contraction rate of land denuded of trees, deep-rooted prairie vegetation planted along the trails and everything from fish and frogs to coyotes and owls – are financial “externality” issues. SWLRT would also result in the loss of approximately 60 acres of habitat and impact 20 wetlands. The Cedar Lake commuter bike trail is laid atop the old Cedar railroad yards – on top, which is why pollution remediation was not required. A toxic plume could ooze into the construction-disturbed ground and groundwater. Turning our living lakes into scenery would be irreversible. Graphic courtesy of Susu Jeffrey. The ethanol and oil-carrying heavy freight trains co-locate along about eight miles of the proposed SWLRT electric track but only one mile is protected by the wall because of regulations. Co-location of freight trains carrying hazardous cargo next to electrified trains in the Kenilworth Corridor inspired an LRT Done Right, “Blast Zone” Map. The half-mile evacuation zone based on US DOT safety regulations for ethanol/oil rail fires include: Target Field, Farmers Market, Dunwoody College, Blake School, Anwatin Middle and Bryn Mawr Elementary schools, Kenwood Elementary School, as well as my house. The final environmental impact study finds that “The Project operation will increase the greenhouse gas emission in the Twin Cities area by approximately 2,000 metric tons per year in 2040, compared to No Build alternative” (SWLRT FEIS, p. 3-204). That is, SWLRT adds to the annual projected regional total of greenhouse gas. In terms of meeting the state’s greenhouse gas reduction goals, it would be a net benefit to Minnesota to not build SWLRT. 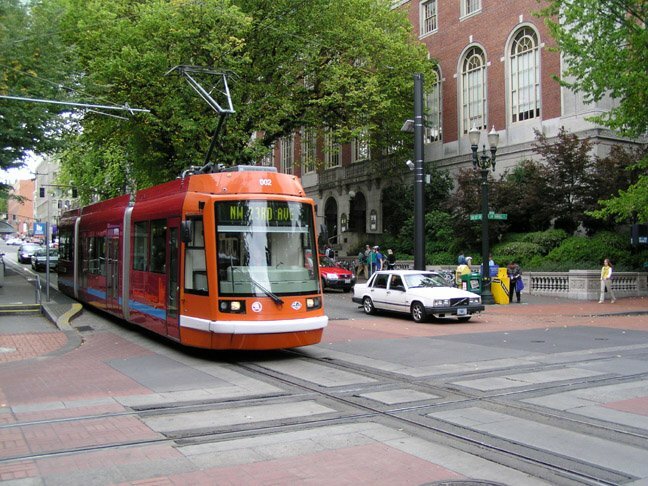 Greenhouse gas reduction from LRT is contingent upon the route. The proposed track of SWLRT in Minneapolis is through residential and park areas, not densely enough populated to obtain high ridership. If SWLRT had been scoped through Uptown or the Northside it would help more people, and more might be on board. The Metropolitan Council recently rejected all four construction bids on the basis of price and “responsiveness.” The construction package included 29 new bridges, modifications to seven existing bridges, six new pedestrian tunnels, two LRT tunnels – under the Kenilworth corridor and Highway 62 – in addition to demolishing 14 buildings, building 15 stations, 117 retaining walls, 153,440 feet of track, freight rail relocation, underground utilities, drainage, sidewalk and road pavements, street lighting, traffic signals and foundations for the overhead light rail electric poles. Good article, but we do sometimes forget the relationship between getting cars off of the roads and clean water. There is also a relationship between less road use and future dollars saved, although this will take quite a long time for a break even! We too often think inside our little box and forget to realize that this will affect people long after we are gone. Of course if this were done many years ago as it should have been in urban planning it would have been much cheaper. I am obviously pro-mass transit so I admit my opinion is a bit skewed. Excellent points. This train needs to be rerouted to dense population area of the city such as Uptown, Lyndale or Nicollet Ave.
Or better yet not built at all and use the money to start single payer health care for Minnesotans. The risks are to high in regards to environmental damage to our city lakes, urban forest and the creatures great and small who live there. Amazing how they snooker us- SWLRT and proposed Bottineau take great pains to avoid density, areas that don’t have parking or- People can’t afford cars. As mentioned, one is routed through the woods, the other literally through a golf course. Of course, they hire engineers to say tunneling is impossible, but then offer up any kind of tunnel needed in their chosen route as soon as there’s an impediment. The other route they just say ‘we’ll have to tear down all your homes’. Of course, the decision is already made, regardless of cost, practicality or if they have to kill every one of us. You have been beating this drum for years, and it is ironic that in the name of progressive values you would stand on the same side of the issue as right wing opponents of transit, a bigoted Hopkins mayoral candidate, and the wealthy NIMBYS of Kenwood. I do not trust that you are presenting these factoids in the proper complete context. SWLRT is part of a network: the continuation of the Green Line that connects to downtown St. Paul, giving residents along this central corridor access to jobs in Eden Prairie, just as the extension of the blue line will link into north Minneapolis. The transfer connections onto local and express buses will make this useful to many different citizens of differing needs. As for the urban route through Uptown suggested, that was considered early on but was calculated to be twice as expensive. 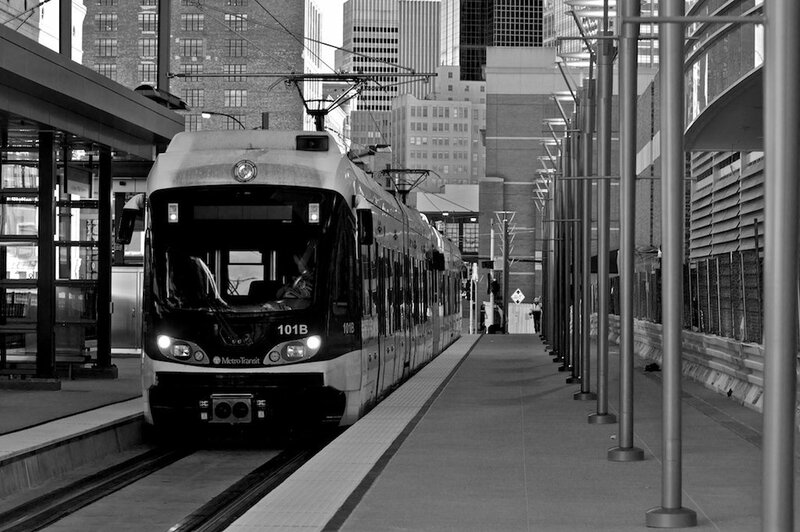 Mass transit is an important resource to North Minneapolis residents in particular.